Productivity and accuracy in fulfillment are two constant challenges in today’s distribution centers (DC). As the Amazon affect begins to make every company a multi-channel fulfillment company, knowing if you are picking the right order or, more importantly, picking the order in the right way becomes an important determinant in the overall productivity of your operations. At a macro there are two basic pick methodologies – Process Based Picking and Layout Based Picking. Process Based Picking focuses on how the order is picked while layout based picking focuses on how the pick area is organized and operational flow. To help maintain labor productivity and order integrity, wave picking requires more analysis in the type of handling cart used in the pick process. For example, an operator picking a wave with 4 orders would require a pick cart or pallet setup to stage 4 cartons or totes that are easily accessible to the operator. This planning is simple if you are working with 4 small cartons, however if the boxes are larger or you have more orders in the wave, the planning and cart design becomes more complex. Additionally, pick cart design will have an impact on space requirements or availability. When picking one discrete order to a carton, aisle width is not a major consideration. However, when wave picking multiple orders, pick carts will require more maneuvering space and typically largest pick path aisles. The wave pick process is the same as the discrete pick. The operator is directed to each bin in sequence, and told the product, packsize and quantity to pick. You pick the required product, and scan its barcode label. You are then told the carton number into which to pack the product. You place the items into this carton, and scan the label for that carton. Finally, you enter the quantity of product you picked. You are then directed to the next pick which could be another pick for the same item to a different order in your wave, and the process is repeated, until you have picked and packed all orders in your wave. The primary benefit of wave picking is reduced travel time associated per order. For example picking four orders on one pick tour (in a wave) would reduced the average travel time associated to each order by up to 75%. Factoring in the ability to pick the same item for multiple orders while at the location will reduce associated average travel time per order even more. Cartonization is a companion to wave picking. Cartonization automatically determines the number of shipping cartons required for a single order based on product and carton dimensions. It also takes into account the weight tolerance of both cartons and shippers. Pickers are then instructed to place product into the specific shipping carton that was pre‐determined by the cartonization function. The advantage of cartonization is that orders being shipped by common carriers like UPS or FedEx can be picked into their final, labeled shipping containers. Even if there are multiple boxes on a shipment, there is no need to consolidate the order in a staging area prior to shipment. With the right system in place, you can select individual products you want to pick, usually from a previously-picked collection of items, and pack them in the sequence that you choose, rather than in the sequence of bins. In this method, you identify the product to pack and the system prompts you with the quantities and cartons required for each order in the wave. This method is typically used in a Batch or Replenishment Pick process where it is not feasible to bring cartons through aisles, or in which it is more efficient to split up picking and packing functions between two or more people. It can also be used to allow experienced pickers to pack orders correctly the first time (for example, by packing the largest items at the bottom of the cartons, etc.) without having to re-pack them later. Keep pickers picking…not waiting…Keep a queue of orders and/or products available to the picker. This requires an effective replenishment strategy if you are using a forward pick/reserve storage layout. Keep pickers picking…and not doing non-pick tasks…Do not bog pickers down with other tasks such as carton erection and taping, labeling, wrapping, adding dunnage, etc. 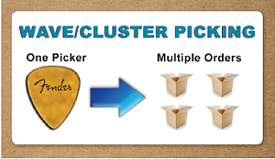 Pickers are typically your most skilled warehouse resource. Minimize product touches…Ideally, it is best to design your pick process so that there is sufficient accuracy at the time of picking to eliminate the need for subsequent checking and repacking. Each unit of product is touched only by the pickers’ hands before the carton is sealed and transported to an outbound truck. Minimize travel…Pick from both sides of the aisle from properly sized pick modules. Unused space between pick modules and pick lanes can unnecessarily lengthen a pick path. Segregate slow movers from fast moving SKUs to avoid repetitive, unproductive travel past them when not needed. Consider picking very slow moving SKUs from reserve storage rather than forward pick bins. Seek opportunities to batch pick many smaller orders in one trip. Pick all one-line, single-piece orders together since no sorting is necessary to break them down into a discrete order level.